On a rare congressional visit to Tibet, since the 2008 deadly riots, a delegation of seven US lawmakers from the Democrat Party led by House Minority Leader Nancy Pelosi, has visited the Tibetan region under tight police surveillance. Delegation member, Rep. Jim McGovern expressed his impressions on Beijing’s Tibet policy, highlighting that “the Chinese government has invested a great deal in Tibet, and that was very clear to us (…) But that investment should not come at the price of an entire culture. You cannot confine a people’s culture and heritage – their very sense of identity – to a museum or a market of handicrafts.” He further called on China to allow the US to open a consulate in Lhasa, lift restrictions on foreign lawmakers, allow foreign journalists access to Tibet and to renew dialogue with the Dalai Lama. The delay in giving a robust account of the trip gave Chinese state-run media ample time to offer their own glowing accounts of the visit. The state-run Tibet Daily said that Pelosi “gave high praise to the huge changes in the new Tibet and to the hard work of the Chinese government in protecting religious freedom, preserving traditional ethnic culture and protecting the ecology.” No mention of heated exchanges was made during the state-run CCTV’s evening news broadcast about the visit. Activists in China and elsewhere are now questioning whether the unusual visit might mark a new era of dialogue and openness about Tibet on the part of the Chinese government — or may signify an increasingly sophisticated public relations strategy by propaganda officials who are confident they have gained the upper hand in Tibet since deadly riots in 2008. Though there have been no reports of such mass violence in Tibet in the last seven years, about 140 people in Tibet and neighboring areas of Sichuan and Gansu provinces have immolated themselves since 2009 to protest Chinese policies that they say limit their freedom of movement, speech and religion, particularly their right to venerate the Dalai Lama. “It’s really interesting that Nancy Pelosi was invited. She is certainly the staunchest friend of Tibet to go there in the last few years,” said Alistair Currie, campaigns and media manager for the Britain-based group Free Tibet. This summer, Sarah Sewall, the State Department’s special coordinator for Tibetan issues, said that over the last four years, 35 of 39 requests made by the U.S. Embassy or consulates to visit the Tibet Autonomous Region had been denied. But following years of almost total lockdown after the unrest in 2008, Currie said, there has been a “very gradual opening up” since 2012, with Australian Ambassador to China Frances Adamson visiting in 2013 and U.S. Ambassador to China Max Baucus visiting in May. Pelosi said that hers was the first U.S. congressional delegation to enter Tibet since 2008 and that the visit focused on issues including human rights and climate change. Besides McGovern, other members of the delegation -- all Democrats -- were Reps. Alan Lowenthal of Long Beach and Ted Lieu of Torrance, Betty McCollum and Tim Walz of Minnesota, and Joyce Beatty of Ohio. 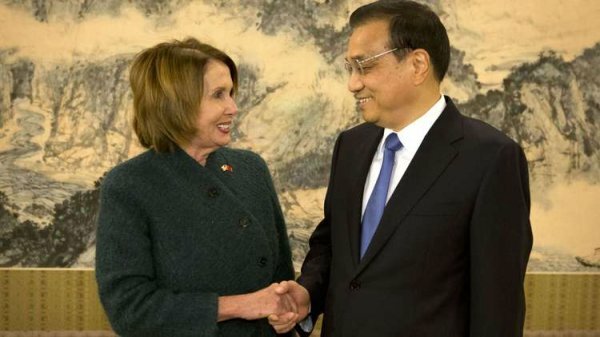 Pelosi indicated the visit arose after she raised concerns about democracy and human rights with Chinese President Xi Jinping during his visit to the U.S. in September. “He said, at the time: ‘Come see for yourself.’ I considered that an invitation,” she said. But she said that Chinese authorities did not approve the lawmakers' visas for Tibet until the day before they left and that non-Chinese media were not allowed to accompany them. Among the sites visited by the Americans was Potala Palace, the traditional home of the Dalai Lama, and Sera Monastery. The group met with officials including the Communist Party chief of Tibet, Chen Quanguo; the vice party secretary of Tibet, Baima Chilin; and the Communist party boss of Lhasa, Qi Zhala. Earlier this year, Chen called for Buddhist temples and monasteries in Tibet to become propaganda centers for the Communist Party, turning them into places where monks and nuns learn to "revere" science and appreciate the party's love. Woeser, a Tibetan activist and writer who generally goes by one name, said China’s increasingly frequent but highly controlled invitations to visit Tibet pose a quandary for foreign dignitaries, reporters and others. Currie recalled that in 2014 China invited a group of foreign dignitaries to Tibet, including the former mayor of Christchurch, New Zealand, Bob Parker, and a senior Labor Party politician from Britain. In September, Chinese authorities invited a few foreign journalists from outlets including the Associated Press to visit Tibet; AP reporter Aritz Parra described it as a tightly scripted visit to showcase Tibet’s development. Geshe Nyima, a cousin of Tibetan spiritual leader Tenzin Delek Rinpoche, who died in Chinese custody in July, said his friends and relatives in Tibet tell him that their communities remain under tight police control and surveillance.